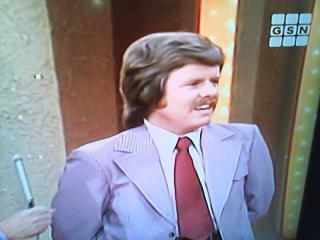 Man with Biggest Head In The World on Match Game ’75. 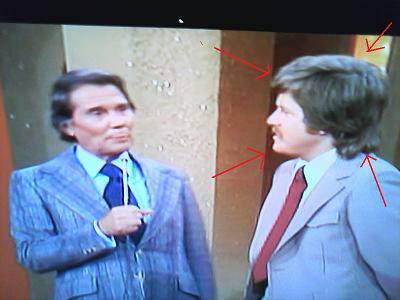 Home → Damien Zone → Man with Biggest Head In The World on Match Game ’75. The man with the biggest head in the world once made an appearance on the popular game show “Match Game 75” but since that show aired nearly forty years ago, nobody knows what happened to Brad Alexander – did his head get bigger? Is he still alive? Has his head been surgically repaired and made smaller? The big question is, “How did the people of The United States let a man with a head that big get away without duly noting that he did indeed have the biggest head in the world? “I was waiting backstage with Gene Rayburn the host during a commercial break and we could not believe the size of this guy’s head,” said Joe Tremont, a cameraman who worked for many years on network gameshows. In the photo above you can see Gene Rayburn leaning back and away from the head that could have killed him if it struck him during the Big Money Match. TheDamienZone called in a forensic team of anthropologists and using the footage from the TV they were able to determine that Brad Alexander’s head was the largest human head on record. It is believed to be 37% larger than Rosie O’Donnell”s head and 33% larger than Fox News Business analyst Neil Cavuto’s head. These two stats put Brad’s head at about 27% larger than the largest head in the world which belongs to a Ukrainian man, Olech Kimoskova of Kiev. Kimoskova believes that he holds the record because Brad Alexander is only seen on tape and has not been seen in real life for nearly forty years. “He was man on Match Game,” said Kimoskova in heavy Ukrainian broken English from the cramped apartment in Kiev he shares with several of Ukraine’s most famous motion picture directors. Ukrainain directors are scrambling to make a motion picture about Kimoskova’s head to show next year at the Ukarinain Film Expo in Kiev, but as of yet they are hesitant — fearing that Brad Alexander will be located and their roomate’s head will be just another runner-up. TheDamienZone is amazed that a head this big can even be carried by ordinary neck muscles. Doctors we have spoken to said that if Brad is alive, he must have serious back and shoulder pain. Brad has a really super cranial capacity. I would like to know what happened to him and would like to see more photos of him.